SABATH, Adolph Joachim, a Representative from Illinois; born in Zabori, Czechoslovakia, April 4, 1866; attended the schools of his native town; immigrated to the United States in 1881 and settled in Chicago, Ill.; was graduated from the Chicago College of Law in 1891; was admitted to the bar in 1892 and commenced practice in Chicago, Ill.; ward committeeman and district leader in Chicago 1892-1944; appointed justice of the peace for the city of Chicago in 1895; police magistrate 1897-1906; member of the central and executive committees of the Democratic Party from 1909 to 1920; delegate to all the Democratic State conventions 1890-1952; delegate to all Democratic National Conventions 1896-1944; elected as a Democrat to the Sixtieth and to the twenty-three succeeding Congresses, but died before the convening of the Eighty-third Congress; served from March 4, 1907, until his death in Bethesda, Md., November 6, 1952; chairman, Committee on Alcohol Liquor Traffic (Sixty-third through Sixty-fifth Congresses), Committee on Rules (Seventy-sixth through Seventy-ninth and Eighty-first and Eighty-second Congresses); interment in Forest Home Cemetery, Forest Park, Ill.
Manuscripts Department, Special Collections Division, Howard-Tilton Memorial Library. Papers: 1849-1952, 4 boxes and 237 volumes. The papers include chiefly autobiographical and biographical material about Adolph Joachim Sabath, collected or written by fellow Czech immigrant J.L. 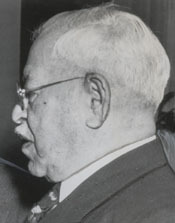 Tupy, who worked closely with Adolph Sabath in the 1930s. The papers contain correspondence and biographical sketches of Adolph Sabath, memoirs, speeches, articles, and scripts by or about him. The papers also include materials of J.L. Tupy, consisting of correspondence, a notebook, radio addresses, reports to the House Select Committee to Investigate Real Estate Bondholders' Reorganizations of which Adolph Sabath was chairman, a memoir of J.L. Tupy's association with T.G. Masaryk, and a real estate ledger (1926-1930). There are miscellaneous manuscripts of writings, volumes of the Congressional Record (1908-1944), the Yearbook of Agriculture (1942-1944), and other printed matter. Subjects covered in the papers include Adolph Sabath's role in the working class movement in Chicago, his activities in the New Deal, Czech immigrants in the U.S., the Bohemian nobleman Count Lützow and the U.S., and the contribution of Woodrow Wilson towards the independence of Czechoslovakia. A finding aid is available published in the National Inventory of Documentary Sources in the United States. Papers: 1903-1952, 3.3 linear feet. The papers of Adolph Joachim Sabath include correspondence, legislative bills, copies of Congressional Record, notes, resolutions, speeches, articles, newsclippings, and miscellaneous material. Topics covered in the papers include immigration, anti-Semitism, and Palestine. An inventory for the papers is available in the repository and online. Papers: In the Carter H. Harrison IV Papers, ca. 1637-1953, 11.25 cubic feet. Correspondents include Adolph Joachim Sabath. An unpublished inventory for the papers is available in the library. Papers: In the Harry Weinberger Papers, 1915-1944, 21.5 linear feet. Subjects covered in the papers include Adolph Joachim Sabath. An unpublished finding aid for the papers is available in the repository. Beal, John R. "Adolph J. Sabath." In Public Men In and Out of Office, edited by John Thomas Salter, pp. 196-209. Chapel Hill: University of North Carolina Press, 1946. Boxerman, Burton A. "Adolph Joachim Sabath in Congress: The Early Years, 1907-1932." Journal of the Illinois State Historical Society 66 (Autumn 1973): 327-40. ------. "Adolph Joachim Sabath in Congress: The Roosevelt and Truman Years." Journal of the Illinois State Historical Society 66 (Winter 1973): 428-43. Sabath, Adolph Joachim. Naturalization. Washington: Government Printing Office, 1908. United States. 83d Cong., 1st sess., 1953. House. Memorial services held in the House of Representatives of the United States, together with remarks presented in eulogy of Adolph Joachim Sabath, late a Representative from Illinois. Washington: Government Printing Office, 1953.